Exactly one month after President Donald Trump was sworn into office, Chicagoans gathered near his eponymous skyscraper in protest of his policies on Monday. Charlie Wojciechowski reports. Exactly one month after President Donald Trump was sworn into office, Chicagoans gathered near his eponymous skyscraper in protest of his policies on Monday. Hundreds joined the "Not My Presidents Day" demonstration around noon in the city's Loop near East Upper Wacker Drive and North Wabash Avenue. "We are out here opposing this agenda, opposing his ideology, and saying that we are not going to accept it," Susan McNish, a teacher, said. The protest was one of several taking place across the country, with at least 20 others expected in cities including Los Angeles, New York and Washington, DC. Monday's gathering was the second day in a row demonstrators rallied in Chicago, as dozens marched through the Loop on Sunday afternoon as well. Groups from both sides came together in a peaceful manner for the protest. Debra McKinley said the warm weather drew her to Chicago for the weekend. When McKinley heard about the protest, she said she couldn't stand by without voicing her opinion. "Let Trump lead us," she said. "We are all on the same team. People don't realize that but we are." "If everyone could just get around his style and just give him a chance, then judge him in a year. I think that's the right thing to do." "Be patient and give him a chance," Chris Ehrlich said. "I mean he is America's president. Just give him a chance." "I truly believe he has our best interest at heart for this country." Holly Schaal of Powers Lake, Wisconsin, said she attended the protest because she is "tired of people hating on each other." 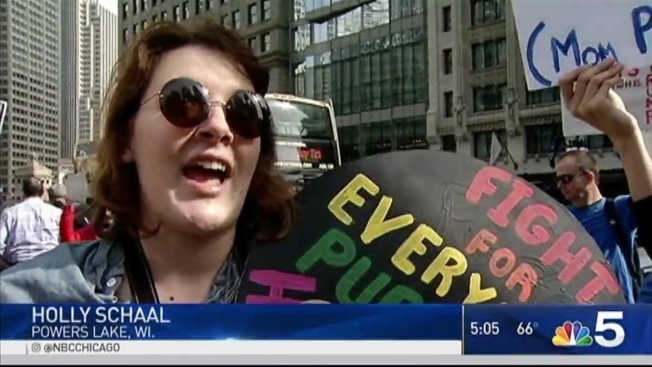 "I just want people to be happy and I want everybody to have rights," Schaal said. "I am tired of Trump and his fiction that is changing everybody's views on each other. We are going backwards."